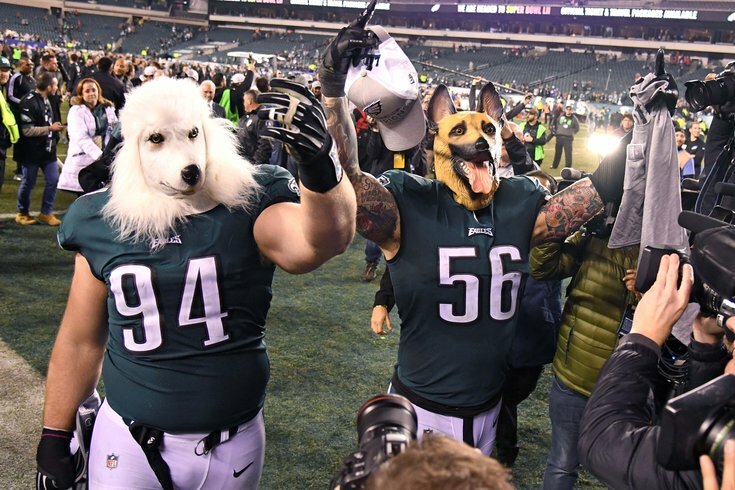 Beau Allen (94) and Chris Long (56) walk off the field in dog masks after beating the Minnesota Vikings in the NFC Championship Game at Lincoln Financial Field. If you're one of the thousands of Eagles fans — or an Eagles player, for that matter — that went out and bought one of those terrifying dog masks during the team's run up to the Super Bowl, head coach Doug Pederson has a simple message for you and anyone else still clinging on to that underdog identity. Move on. Find a new slant. Underdogs no more, the Birds opened up their mandatory minicamp on Tuesday, giving us the most complete look at the reigning Super Bowl champs (as the team had full attendance) since they beat the Patriots back in February to capture the first Lombardi Trophy in franchise history. "It's going to be a part of our fabric, part of our history here in Philadelphia, part of the Eagles organization obviously," Pederson told reporters during his Tuesday press conference at the NovaCare Complex. "I want guys to remember. I think it's the journey that we took to get to see a Super Bowl 52 logo on the wall. It means something different to Jason Peters than it does Big V [Halapoulivaati Vaitai]. I want those guys to remember it; I want those guys to embrace it. "It's a great opportunity for us this season, a great motivating factor for us to sort of rip off the dog mask and no longer be the underdog but now be the hunted and have the target on our back. We have to embrace it and use it as sort of motivation to get back to that game and to do it for the guys who didn't have an opportunity to play in that game last year." Guy like Peters, Darren Sproles, Chris Maragos, Jordan Hicks, and, of course, Carson Wentz. When Wentz went down in Week 14, the Eagles found themselves adopting a new mentality heading into the postseason, one not typically associated with a 13-3 team that was the No. 1 seed in its own conference. And after beating the wild card Falcons in the divisional round — they were the first one-seed ever picked by Vegas to lose its postseason opener to a six seed — Lane Johnson and Chris Long showed the world that they were just fine playing the underdog role. After all, to quote philosopher and warrior poet Jason Kelce, "Hungry dogs run faster." And, boy, were they hungry. Listed by oddsmakers as the underdog in all three of their postseason games, the Eagles found a way each time to prove their doubters wrong. First it was Atlanta. Then a 38-7 drubbing of the Vikings in the NFC Championship Game. And ultimately, Foles and Pederson found a way to out-Patriot Tom Brady and Bill Belichick in the Super Bowl. Now, it's almost time to put that completely in the past. Almost. Pederson has a very specific idea for when it's time to turn the page and move on entirely from last year's success: "12:01 a.m. on June 15," he said Tuesday, almost without hesitation. Why that date? Because a day earlier, on June 14th, the Eagles will receive their championship rings. After that, Pederson said his players "need to focus on 2018 and get ready for training camp." They're no longer the underdog. They're the top dog, the alpha, the one everyone will be gunning for this season. They'll need to keep running fast. The good news is, big dogs can work up quite an appetite too.